Galco MCII Miami Classic II Shoulder Holster System FREE SHIPPING! The Miami Classic II® is the next generation of shoulder holster systems from the world's premier maker. It combines proven features from earlier Galco holster systems u validated from hundreds of thousands of systems being used in the field u with the latest innovations. The handgun is held in the horizontal orientation of the Miami Classic, for the quickest draw. The harness features the Galco holster trademark spider harness with Flexalon® swivel back plate for all-day wearing comfort. The medium-width shoulder straps distribute the weight of a heavy handgun and accessories, while remaining concealable. The biggest innovation found on the MCII is its new magazine carrier, which securely holds a pair of magazines in a horizontal position, without need of retaining straps. The carrier allows a very fast and ergonomic withdrawal of magazines, two factors always welcome in a life-defending scenario. The strapless design is flat, easily concealed, and comfortable under the arm. The Galco Holster MCII system is constructed of premium saddle leather and includes holster, harness, ammo carrier and a set of system screws. Fully modular and for left handed draw or revolvers - a wide variety of optional accessories and components may be purchased separately. Made for semiautomatic pistols, the Galco MCII is available in right hand draw in tan or black finish. The leather for the straps is a bit thinner than I was expecting, but seem to be holding up well. The rig is fairly comfortable, this is my first shoulder holster. We will see how it works up. I have several Galco holsters. This should have come with the tie down straps. Its not as comfortable as my Bianchi shoulder rig. I think it will work better after I make a magazine side tiedown to offset the weight of my piece. I have never owned a shoulder holster before. This is extremely comfortable. It takes time getting used to the draw. Not as quick as drawing from the hip, but you get used to it. I like using this in situations I don't have a belt on or when I have long road trips. There is a break in period as well. When you first initially get the holster, it might not fit your gun at all. You need to work the leather like a baseball mitt. It will come along. One tip I learn is cover your gun in a zip lock bag and put it in the holster over night. It will speed up the break in process. Break in period was longer than expected, but is coming along fine. I've been wearing this system daily, for nearly a month now, and it has proven to be an excellent combination of COMFORT, Convenience, and Conceal-ability. Of course, it required the usual amount of break-in (a day, or two) for the leather to marry itself completely to the Shield (which is to be expected) and an application of Galco DRAW-EZ, to attain smooth-perfection. Anyone who spends a good deal of time in a vehicle, will find the added merits (comfort and accessibility) provided by this system, that IWB and OWB can NEVER equal when dealing with seatbelts. I've been carrying legally-concealed firearms, for 40 years now, and I am completely satisfied with this purchase. You guys did a great job. Galco OTOH, has a rig that IS supposedly for a S&W MP Shield. NO way in HELL can a MP 9 Shield fit into that holster unless you remove the screw. ( or your a Gorilla, I am 6'3'-235, and I gave up. I used my G43 it works well, the S& W(NO way),the other issue I had is they only came with 4 screws n' nuts, not the usual four like the Jackass(which I have had for 12-20yrs and love.) So to keep things NEAT I ordered another pack of screws from Galco for 6.00,(at least it was free shipping). No clue without wasting more time than I have to give, to try and get the S&W MP9 Shield to fit that holster. Plus the rough side of the straps shed excess leather particles, and if you wear a T shirt under it get ready to clean it off as it's covered with loose RAWHIDE particles. Never had these issues with the Jackass. Nice rig. Great quality couldn't be happier with it. I was looking for best shoulder holster without having to tie it down to my belt. ive seen lots of reviews on this holster so I decided to go for it because I needed a good winter carry holster. gotta say, I really love this thing. fits so well. lots of adjustment. conceals nicely under a zip up hoodie or jacket. I would highly recommend this product. Very nice shoulder holster. Fits my M9A3 just as it should. Not sure Iike the wider straps on the MCII as well as I do the narrower straps on the Miami Classic. Still, it is a very well made holster. The weapon fits nice and snug. You may have to tighten some of the screws on the magazine carrier. Very nice rig. I have a 52" chest and still have plenty of leather for more adjustment Well made quality holster that is super comfortable. When properly adjusted... it fits like a glove and doesn't move even when leaning forward. I own a brown and a black system for day or night wear and holsters for 3 different weapons. Highly recommend for all day comfort. Kudos. Highly adjustable and comfortable with my 1911. It's made from quality leather and fittings. I wear it all the time now. Whenever I wear a vest or jacket out of the house it's on me. Fits my XDM perfectly. Fits me perfectly & the most comfortable holster that I have ever had. Delivery was quick as expected. Would definitely recommend Galico & CopsPlus. Could not be happier. Top notch quality and leather. Fit is fantastic. Break in was quite easy, just follow directions and be patient. I did order two extra sets of screws previously to use on the open holes and was worth it. Easy to put on and take off. Belt tie downs are not necessary, for when adjusted properly, the rig does not move. CopsPlus is great, will be buying from them again. Great shoulder rig, although I knew it would be, I already owned 2 other to fit other weapons. The new one has wider straps that improve the comfort level. Would recommend to anyone. This is a beautiful holster More importantly it fits my gun like a glove. It is very comfortable and very secure. The only reason I didn't give it 5 stars is because the holster does not include the tie down set which is essential if you ever have to draw your weapon in real life. The tie down set is an additional 22 and basically keeps your holster and magazine carrier secure to your belt when drawing your weapon. Fantastic fitting holster for concealment. My only regret is I didn't buy it long ago. Although I'm glad I waited long enough until the II came. Like the magazine setup a lot more. High quality leather. This holster is exactly as I expected. very well constructed, and very comfortable for all day carry. I would recommend this holster to anyone interested in shoulder carry options. Excellent holster, quality leather, adjustable to fit comfortably and a reasonable price. Quality materials and excellent fit. Ordered for my Crimson Trace Ultra carry 2 fits great really comfortable to wear and functional really good holster system. I have a large chest (60"). Will this holster fit me? This shoulder holster fits up to 52" chest. 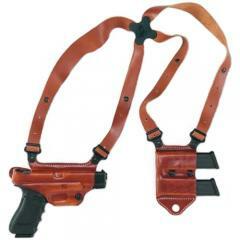 You will need the "Galco Miami Classic Extra Large Spider Harness (part no. MCHX) which will fit up to 64" chest." How do I conform this to left hand? This shoulder holster system is right handed only. For left handed shooters, you will need to purchase the components separately. The Miami Classic is by far the most popular shoulder holster system on the market. Galco uses only the best leather and finest craftsmanship when making the Miami Classic. Made famous by Don Johnson on the TV show Miami Vice, the Miami Classic continues to be a favorite of law enforcement and gun enthusiasts alike. ©2002-2019 CopsPlus.com: Galco MCII Miami Classic II Shoulder Holster System FREE SHIPPING!